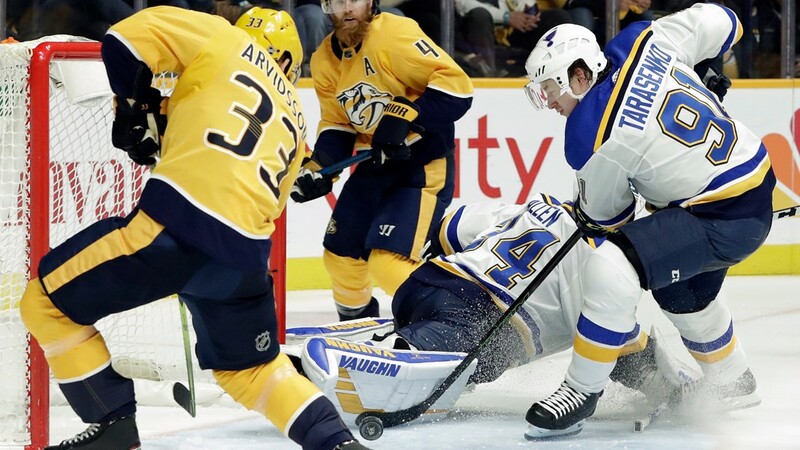 NASHVILLE, Tenn. — Vladimir Tarasenko completed a hat trick by scoring 16 seconds into overtime, and the St. Louis Blues held off the Nashville Predators 5-4 on Sunday, stretching their winning streak to a season-best six games. Tarasenko skated around three Predators and across the slot before beating goalie Juuse Saros stick-side for both the victory and his 22nd goal this season. Alex Pietrangelo and Tyler Bozak each scored a goal. Ryan O'Reilly and Jay Bouwmeester had two assists apiece for the Blues. Jake Allen made 40 saves in his first appearance since Jan. 17 as the Blues took their second game in as many days from Nashville, following up a 3-2 win in St. Louis on Saturday. Now the Blues are 3-1 this season against the Predators ahead of the final game between the teams Feb. 26 in St. Louis. The Blues followed the same formula as Saturday's game back in St. Louis, scoring first and jumping out ahead. After a scoreless first period, St. Louis took a 3-1 lead after the teams combined for four goals over the span of less than three minutes early in the second. Cody McLeod, the bruising forward the Predators brought back in a trade just Wednesday, went to the box for roughing at 2:35 of the second. Johansen had the puck on a short-handed chance in the slot but chose to pass rather than shoot. His pass was broken up, and the Blues went the other way. Pietrangelo beat Saros with a snap shot that hit off the left post and in 19 seconds into the man advantage. Tarasenko made it 2-0 beating Saros glove-side at 4:41, and Arvidsson finally put Nashville on the board with his 23rd this season, tapping the puck into an open net with Allen at the far post at 5:06. Then Bozak capped the wild scoring spree at 5:51, sending a backhander over Saros' stick and giving the Blues a 3-1 lead. NOTES: Tarasenko matched his career-high point streak, stretching his current streak to eight straight. ... Ellis notched his 200th career NHL point with an assist on Arvidsson's goal.